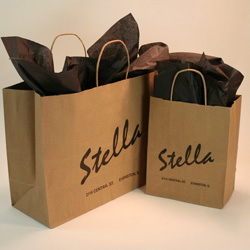 Natural kraft paper shopping bags. Flexo printed 1 color, 2 sides. Click here to see how you can receive free plates on your first order for recycled natural kraft shopping bags. 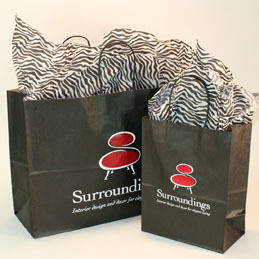 Black kraft paper shopping bags. Hot stamped 2 colors, 1 side. Because of the hot stamp foil, bags may not be recyclable in some curbside recycling programs.